I really love heart shape charms and the bracelet itself fits my small wrist.I got lots of compliments when I wearing it.I'm actually ordering more for my sister and cousins.It's definitely a steal. 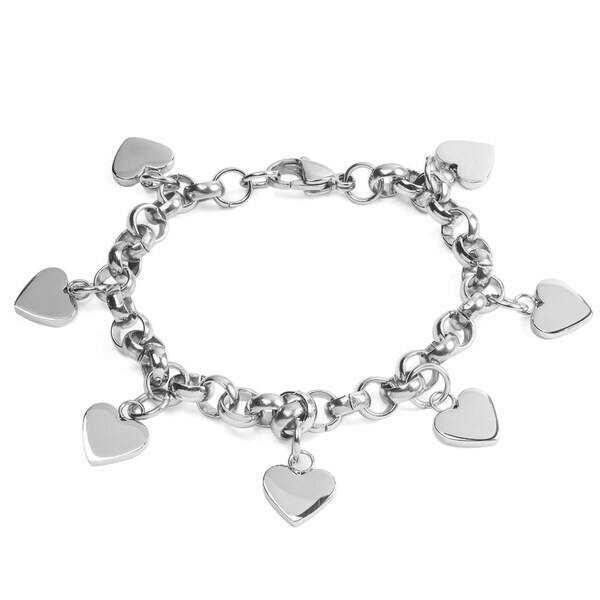 This rolo link bracelet features dangling heart charms that will complement your sweet style. Crafted from stainless steel and secured with a lobster claw clasp. The charm bracelet measures 7 inches long and will make the perfect accent for your everyday style. Fits perfect and the hearts are just the right size. A dainty yet sturdy little bracelet. The hearts were slightly smaller than I thought they would be, but I still like it. The quality and the prompt delivery time, is just great, this is durable, i wear it often !! They keep you updated on your purchases, Yes, i highly recommend Overstock Shopping!! Great bracelet for a little girl. When it arrived it looks just like the pictures. The bracelet looks terrific, was a great price and is well made. Love it great for the price. Not what I expected. It's O.K. but too stainless! Again I love hearts, the length is ideal and low maintenance being stainless steel, ships fast also! I bought 2 already for myself and my sister.I love it and it's nice gift for my cousins and close friends. Being selective and knowing your personal style can help you have a jewelry box full of gorgeous pieces without spending a lot of money. If you're looking to keep up with jewelry trends without breaking the bank, here are a few tips for shopping smart.